Bolsa Grande STEM Team Wins First Place - Sweeps at National Engineer Design Competition! BGHS MESA Club Takes First Place at National Engineer Design Competition! 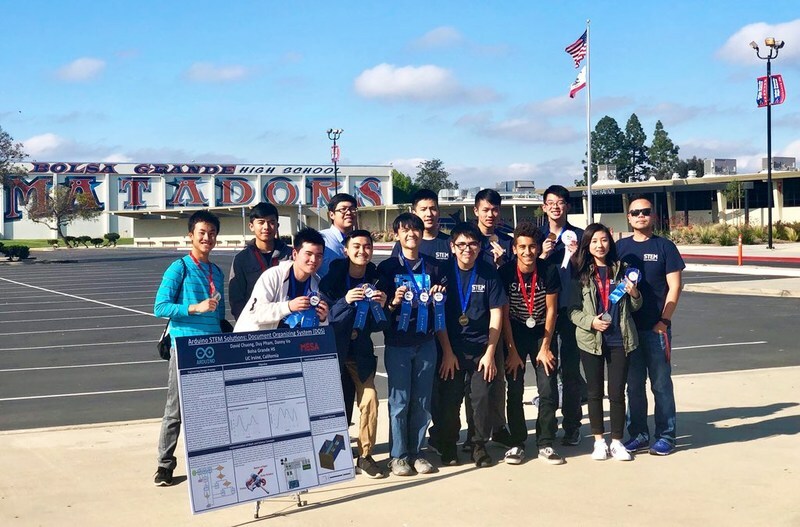 Congratulations to Bolsa Grande High School’s very own STEM Club, advised by Mr. Ryan Tonthat, who placed first at the National Engineer Design Competition this April. This annual, hands-on engineering competition is aligned with the California State Board of Education and Next Generation Science Standards and is facilitated by the national organization MESA (Mathematics, Engineering, Science Achievement). 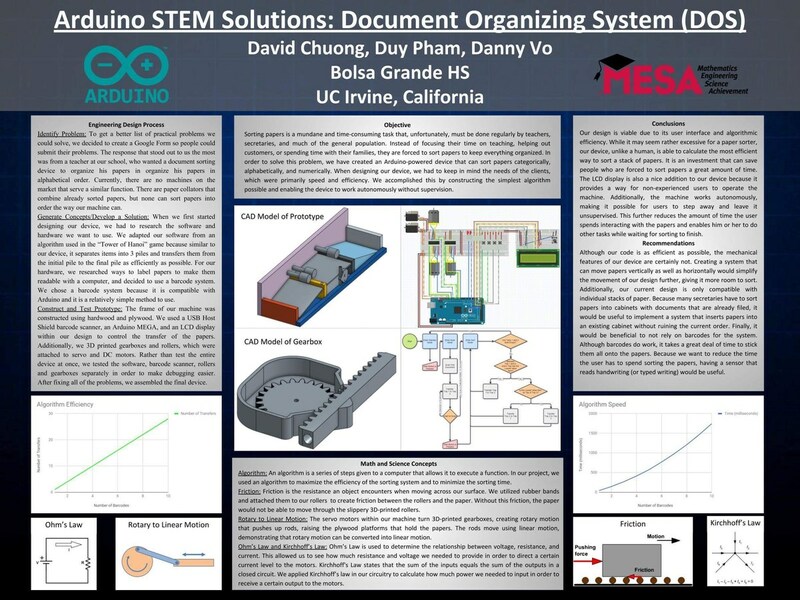 MESA, an organization that focuses on disadvantaged students, has helped thousands of youth to become engineers, scientists, and mathematicians in the STEM field. The “MESA Days Competition” showcases the best of the best, and earlier this month BGHS swept the competition beating out 32 other teams to receive top honors. This win will allow three-man team David Chuong, Duy Pham, and Danny Vo to compete at the state level at UCI in May. This semester, the BGHS STEM team designed and created an original “Document Organizing System” that was made to fit as part of the Human-Centered Design approach of engineering. After surveying the campus with Google Forms, the team determined the best need presented from students and staff. Using Arduino, an open-source platform used for building electronics, BGHS students were able to write code and create an algorithm for their original “DOS” invention, which was constructed from wood and custom-made 3D-printed parts.The device is coded to sort pre-labeled papers categorically, alphabetically, and numerically using a scanner, eliminating the need for teachers to do this task manually. The job didn’t end there. 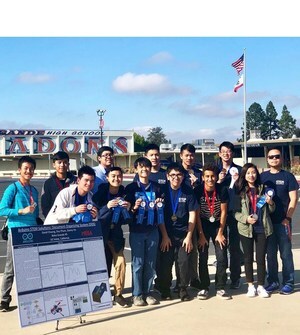 Student teams were also required to meet other rigorous criteria in four categories - a team presentation that included a technical interview, a creation of a prototype poster, a ten-page project report, and a prototype pitch in front of the group of judges. Bolsa took an astounding first place in each category. While the BGHS kids made it look easy this time, the path to first place has not always been an easy one. With future generations in definite need of STEM, the future of these Bolsa students is looking bright indeed. We are immensely proud of Mr. Tonthat and his STEM students, and will be rooting them on in May!